Heetkamp makes a variety of restraints. This page has pictures that Harry Tasker sent me. He has additional pictures on his site. (A link to his page) Heetkamp's address and phone number. 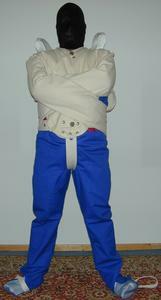 If you contact Heetkamp, keep in mind they sell medical restraints, not toys. The country code for The Netherlands is 31. So if calling from the us the digits would be: 011-31-5486-54235. I understand that an English conversation might be difficult. 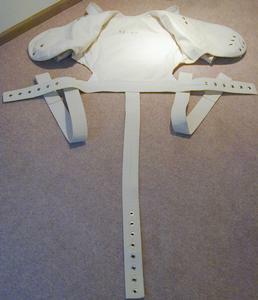 These pictures include Heetkamp's Straitjacket (two different ones), Coveralls, and Restraint Vest. Both garments lock on using "pin" lock, they look a lot like the Segufix magnetic locks. 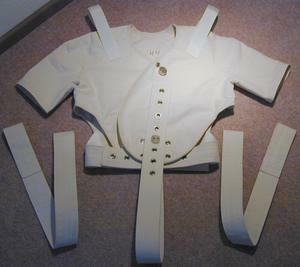 One of the straitjackets pictured has a single continuous sleeve, the other straitjacket has loops at the end of the sleeves. 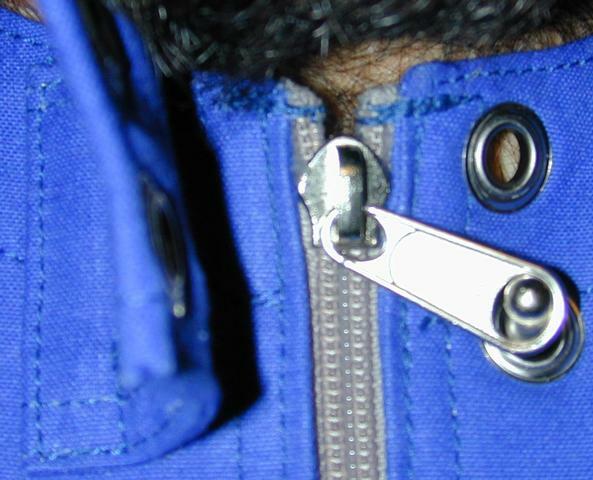 Both have a locking collar and a combination locking waist belt/crotch strap. The locking coveralls lock only at the neck, but they cover everything else! 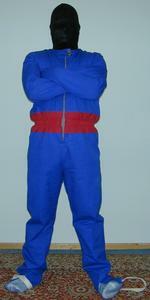 Both the feet and the hands are completely enclosed. Both end in straps to tie them off. All of the pitures here were taken by Lord Grey. Most of them were take at Harry Tasker's place. As of Tuesday, April 23 at 3:53 AM () this page has been accessed 48084 times. Counter started March 13, 2001.